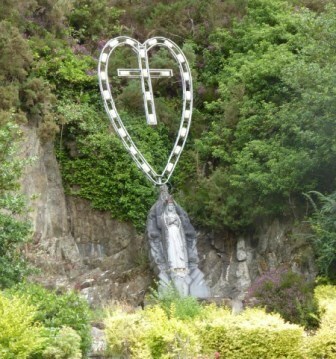 On Tuesday, 15th August next – the Feast of the Assumption – the Annual Devotions will take place at the Lee Road Shrine. The general public will assemble near Our Lady’s Hospital Gate before 6.30p.m. and march in procession to the Shrine reciting the 14 Mysteries of the Rosary on the way. Succeeding groups will follow at short intervals. When all have arrived at the Shrine, the fifteenth Mystery will be recited by the entire congregation. For those unable to walk in procession to the Shrine, there will be accommodation available on the south bank of the Lee opposite the shrine. The Lee Road will be closed to vehicular traffic from the Wellington Bridge to the Shrine from 6.30p.m. However, it may be approached by car from the western side up to 7p.m. A service of buses will convey people back to the city after the Devotions. Gifts of plants and flowers for the decoration of the Altar and the Shrine will be gratefully received on Monday morning at the Shrine. Mass will be celebrated at the Shrine at 7.30p.m. by Bishop John Buckley, Bishop of Cork & Ross. Very Rev. Canon Bertie O’Mahony PP, Church of the Holy Spirit, Dennehy’s Cross, Cork, will preach a special sermon at the Shrine. Seating accommodation at the Shrine will be available ONLY for those genuinely invalided.